Day 23: Hey, chicken shawarma is keto-friendly! Today’s weight loss was satisfying, and a nice start to the day. I hoped that it was a sign that today may be a little better than yesterday, when I was busy busy busy, from dawn until dusk. I had a funeral to attend, so I dropped in work at 8 for the morning meeting, but left by 9:30. I didn’t have time to heat my breakfast at work, so I heated it and ate it in the car on the way to the funeral. It is a nice portable breakfast in a small plastic bowl with a twist top. Who needs McDonald’s breakfast? There was a nice lunch after the service. It was also my first attempt to eat at a public gathering with a wide selection of forbidden foods. I grabbed a croissant sandwich and removed the croissant, which left me with 2 slices of ham and a slice of cheese. I topped it with a tbsp of mayo. I bypassed the hot pastas, the macaroni salad, the cold pasta salad, the bread…well, you get the idea. There was a bowl of salad greens, so I partook of that with vinegar and oil for a dressing. I watched Rick enjoy 2 desserts while I sipped my water, but I must admit, it wasn’t difficult. I think the secret to staving off the cravings for carbs is to avoid them entirely. The afternoon was spent trying to line up a nursing home for my dad, which was a bit stressful. Our truck was still in the transmission shop and we were waiting to hear how many more millions of dollars we’d have to fork over. I guess the $1200 we’d already wasn’t enough to get it fixed right! So, we borrowed Brandon’s car and ran all of our errands. By the time we were done, in the late afternoon, we received a call saying the truck will be ready the next day and cost ZERO dollars more. Yay! Having not eaten a whole lot for lunch, and after stressing all afternoon, I was pretty hungry by dinner time. 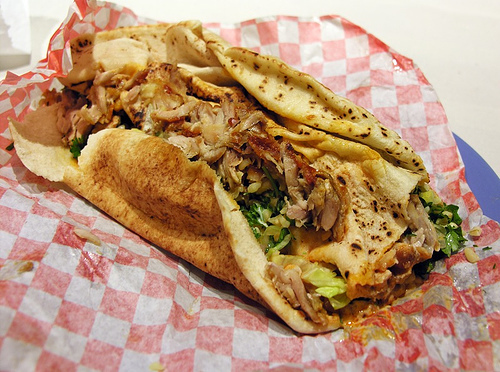 Somehow we began talking about a local restaurant that makes really good chicken shawarma. I instantly thought, oh, I can’t have that. Then it hit me: I can! If I avoid the rice and/or pita wrap, all that remains is chicken in a garlicky marinade/sauce made from yogurt, vinegar, garlic, tahini, and spices – with a small pickle that peeks out, as well. Sooo…I gave Baba’s Kabob and Chicken a call and ordered carryout. It had been a pretty long day and I was exhausted. After dropping by to pick up 4 shawarma wraps and a kibbee (for Rick), I was looking forward to an enjoyable meal in the recliner watching Downton Abbey on the big screen TV. I picked up my meal from the drive thru (and gave my sales pitch about the importance of them having a Palmerworks-designed website) and hied on home. I was a little disappointed to see how little of the carb-friendly portion remained after removing the extra large pita. It wrapped quite a few times around the shawarma. 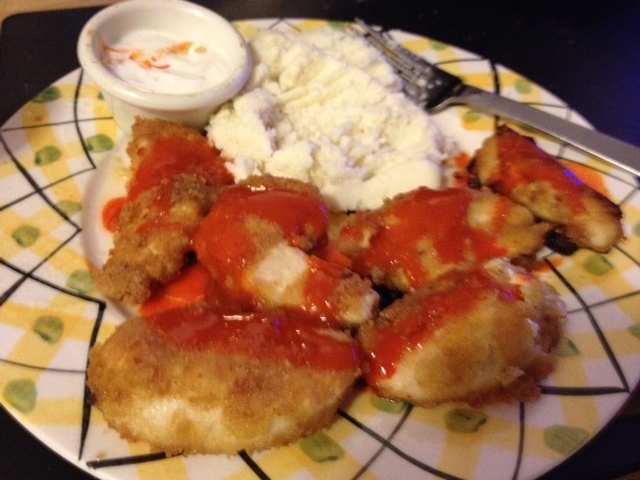 I denuded 2 and the result was a full plate, if not a very high pile of chicken. 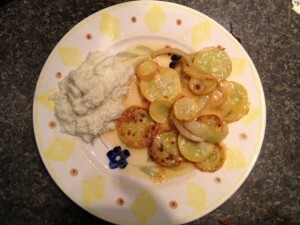 I spooned on a little garlic sauce, took my time eating and relished the flavors. Mmmmmmm…I was quite full by the time I was finished, and I was not disappointed. Baba’s shawarma is the best in town. I admit, it was difficult not eating the pita portion; not because I’m a huge fan of pita bread, but because it was dripping with the delicious sauce from inside. I ripped off a 4×4 piece and added that to my plate. I was still under carb count by the end of the evening. I forgot to take a picture, but this photo I found online looks about the same before I stripped it down. Since dinner was around 5, I was hungry for a snack around 8. I took out my Greek God’s yogurt, swirled in 2 tbsps of Smucker’s natural peanut butter, and let myself believe I was eating some type of peanut butter mousse. It was good enough that I convinced myself pretty easily! Finally, the numbers continue to drop. LOL. Of course, it’s only been two weeks, so I can’t complain about a 10-pound weight loss. Especially since this has been so easy to accomplish. Yesterday, I ate the usual breakfast, but deviated from my lunch pattern and had leftover cauliflower and one slice of eggplant. I had a pre-dinner snack of a cup of Greek yogurt with two tbsps of natural peanut butter stirred in (YUM) because I knew the chicken would take awhile to cook. For dinner, I decided to try frying chicken strips with pork rind coating. My son, Brandon, had some good luck with it, although he used bacon grease as a frying medium. Since I don’t have any, I used olive oil. I pulverized one whole bag of rinds in the food processor and used almost all of them. At around $1.80 per bag, that made the entire chicken dinner come to about $5 for both of us, which isn’t bad at all. I think I’ll do as Brandon suggested and process a couple of bags in advance and just keep them on hand in a container to use as breadcrumbs. The chicken turned out very well. Rick loved it. I thought it was a little bland, so I added Frank’s redhot buffalo sauce and dipped the “wings” in blue cheese dressing. We had the inevitable cauliflower mashed potatoes left over from the night before as an accompaniment. No dessert tonight. Somehow I went over a little on the carbs. Rick was out of Taco Bell hot sauce and used the verde packet instead. 2 carbs! Who knew? The hot packets are zero carbs each. I also am not sure whether I was actually on track or went over by 4. It depends on which nutritional info I use for the yogurt. I’ll have to investigate the actual package when I have time. Yesterday was pretty unremarkable, except that I finally tried BBQ pork rinds and greek yogurt. Both were pretty good. I woke up feeling under the weather. We’ve been passing some kind of bug around the family. I wasn’t very hungry for lunch and I also didn’t feel like cooking anything. I made a few cheese chips, topped them with artichoke dip and called it a meal. 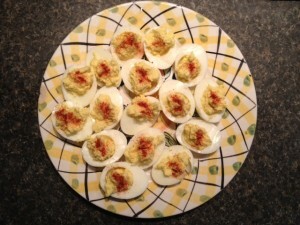 After sleeping most of the afternoon, I decided to make some deviled eggs. I used the typical family recipe I’ve always used – added a little mayo, mustard, and onions to the yolks – and they were yummy….and legal keto! I made a nice boring arugula salad topped with Caesar dressing. Then mixed a tbsp of peanut butter into some Greek yogurt for a refreshing end to the somewhat sparse meal. I guess the biggest problem with eating keto while sick is trying to get enough calories and fat for the day. I didn’t get a chance to try to use coconut oil in a dish. We’ll leave that for later today. Unfortunately, my dad has gotten whatever we all have, but at 88, I need to get him to the doctor pronto. Not sure how regimented this day will be. Let’s see if I can stick to the keto plan on the run.